Zynga Returning to Las Vegas for Live Poker Event? Though there hasn’t been any official announcement yet, nor do we have any insider knowledge … Pokerati’s exclusive screengrab journalism (and an iPhone that seemed to be buzzing moreso than usual this weekend) can confirm that the world’s largest online poker operation — and the only one with enough cash to buy up Full Tilt AND PokerStars (and Steve Wynn’s personal art collection should they want it) — will be back in Las Vegas for live action poker soon. 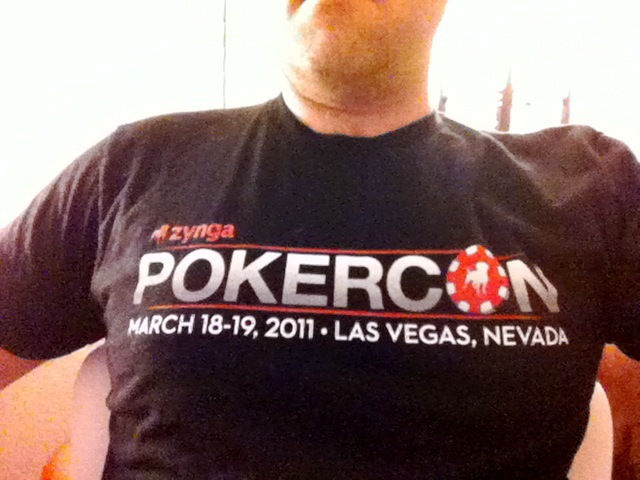 Lol to think I was wearing this T-shirt a couple months ago when someone noticed that a full year since the first ever Zynga Pokercon had come and gone with nary a mention, let alone much talk of a second such tournament event. Gaming Social: Perhaps surprisingly, this photo was not taken with Instagram. Kinda surprising considering that Zynga’s top executives had been chattering incessantly all Q1 about the company’s future in online gambling … almost as if their stock price depended on it! Before the end, the final six would chop it up, each player taking $10,000, and the winner getting a bracelet and an additional $5,200. Alanen, 43, seems a humble dude who won’t deny that luck certainly played a big factor in his win. Extra lucky for Zynga, probably, that their first ever real-life champion happens to have the initials AA. Alanen says he plans to give a portion of his winnings to the Red Cross for Japan relief efforts. UPDATE: Confirmed. He is both. Plays microstakes NLH and PLO on FTP. 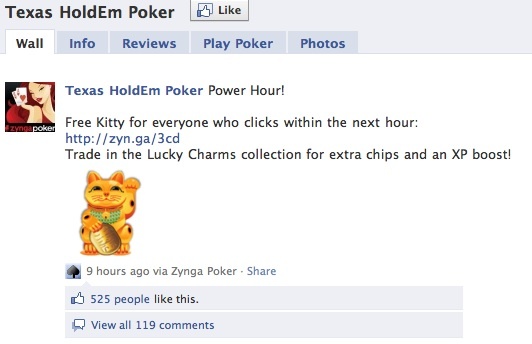 $15k may not seem like much to grizzled poker veterans capable of blowing that on a bad day without a Kleenex, but it’s by far the biggest prize ever paid out in Zynga history … the only one actually. And should Aaron or any of the other final six decide to put their winnings back into the Zynga economy … at the current rate of exchange (handled with ease by American credit card or PayPal) they’d become instant multibillionaires. $7.3 billion to be more exact … $4.8 billion for 2nd through 6th. Damn, that would be enough to bowl over the Zynga big game, which from what I understand features the most monster-stacked ballers on Zynga playing $1mm/$2mm NLH. They’d also have the option of redeeming their real American brick-and-mortar casino cash in Zynga Casino Gold if they think precious virtual metals are gonna continue to rise in value. One thing that is very different here compared to other tournaments seen around Vegas has been the LACK of patched up players in the field. Surely it’s gotta be a matter of politeness from Full Tilt and Stars, right — not wanting to crash this online+live poker newcomer’s coming out party? 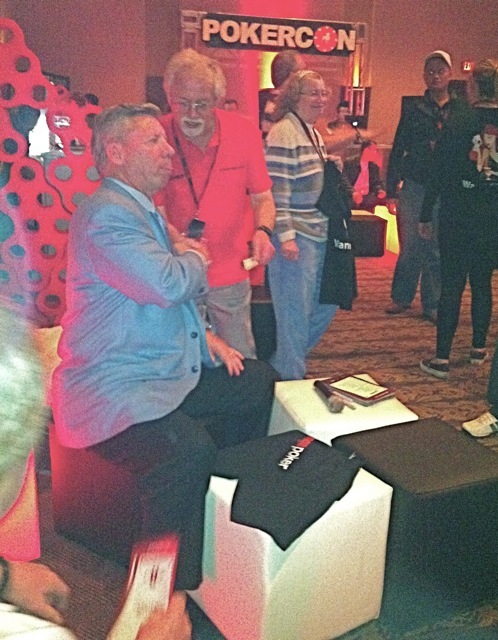 Saw Doyle Brunson with a Doyle’s Room patch yesterday … but hey, he’s Doyle … and @Pokerati, we have no couth, obv. So big-good luck to Team Pokerati’s lone representative in the inaugural Zynga Pokercon, Stacey Nutini, aka Stacey Lynn, aka @LasVegasPokers. She just took her seat as alternate #23. As the first ever live event for the world’s biggest online poker site (Stars wanna challenge the assertion?) 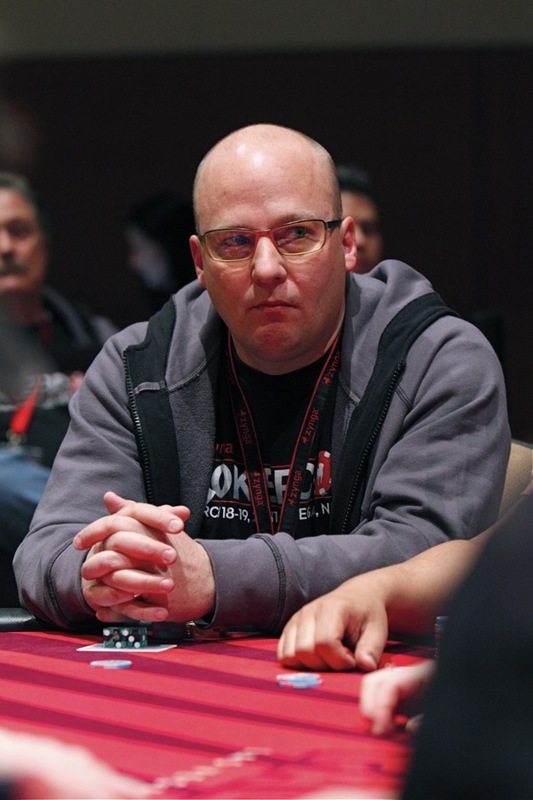 gets underway … we are seeing the super-hyper-turbo nature of free poker play translated to a two-flight weekend at Zynga PokerCon. 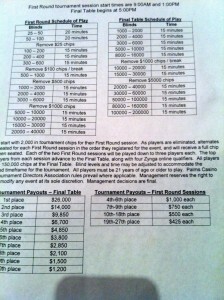 There were 45 players left (from the first flight of 250) with blinds at 1,000/2,000. They started with 2,000 chips each, so that translates to … bear with me, doing math here … 18 percent of the field left, 5.5 big blinds for the average stack. UPDATE (12 minutes later): Blinds just went up. Average stack is now 2.75 BB. UPDATE (3 minutes later): We are in the money. 27 players remain. UPDATE (1 minute later): Blinds are up to 3,000/6,000. 3.2 BB for the average. Though I can hear Matt Savage and Allen Kessler cringing on the inside from wherever they are, the one guarantee with such a faster-than-charity structure is lots of exciting all-in hands. So in some ways reminds me of a WPT broadcast from a few years ago. CORRECTION: See what happens when you assume? Turns out Matt Savage created this blind structure! 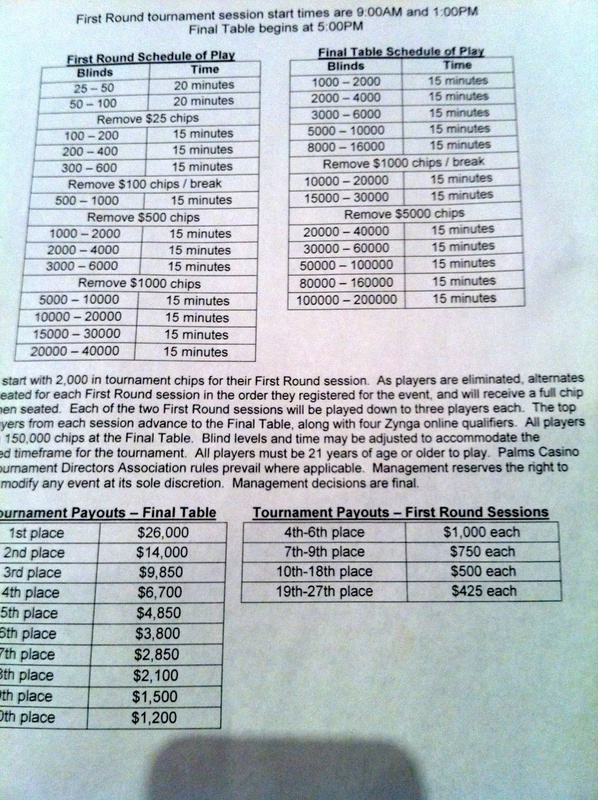 Click the image above to enlarge the blind and payout structures … they play each flight down to 3 … and then sit four others who qualified for ITM seats on Zynga Poker. 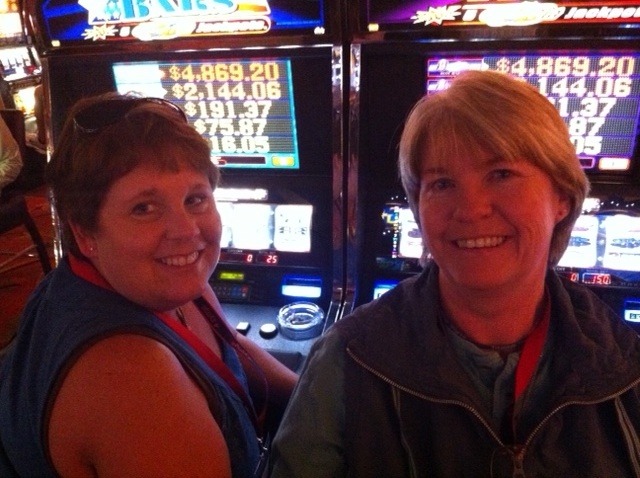 Seen here, playing slots outside the poker room at the Palms: Annie Shea (right) and her not-quite ready for Zynga Poker friend Rene Knapp — passing time while waiting to attend the afternoon Annie Duke poker school. Ms. Shea is one of 500 Zynga players who got into this event, which sold out days ago. Shea comes into this event with 7.5 million play-money chips in her bankroll. Tonight’s semi-random collection of websites that have recently caught my eye for various reasons is brought to you by Suited Cribs — your 2011 WSOP housing hookup and VIP services connek! G2E Asia — the AGA brings its trade show to Macau, prepping Western gaming industry round-eyes for a new level of expansion in China and across Asia. PokerGives.org — Mike Sexton, Linda Johnson, and Jan Fisher’s philanthropic endeavor has undergone a website redesign as they continue efforts to make sure charity poker tournaments give back as much as possible. DFW Gambler — don’t know who runs this site, but it kinda-sorta picks up where Pokerati left off upon skipping town, keeping the Dallas/Fort Worth poker scene up to date with solid, regularly updated info on local charity tourneys, big events in Oklahoma and Louisiana, and different free games — whether they be WPT Amateur Leagues or lesbian bar poker at Sue Ellen’s. Bingo, too! The Poker Life Coach — Jen Dunphy was once responsible for keeping Harrah’s employees on their A-game, and now brings her motivational services to MGM Resorts. Not sure if she’s more happy drill sergeant or corporate therapist … but for poker players needing to work on their life skills (she won’t give up names of clients? 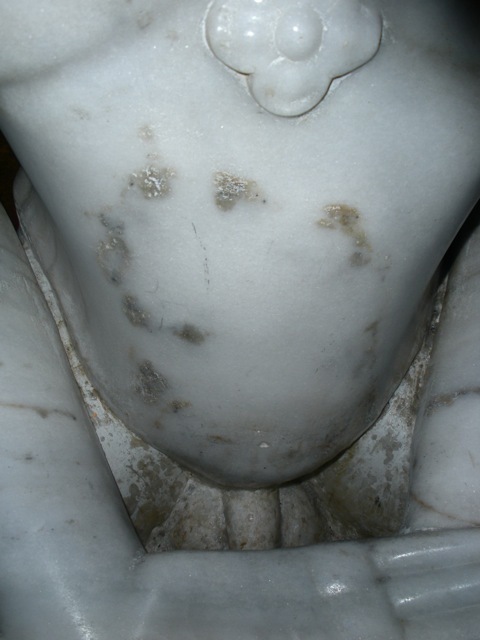 Balls!) it seems she’s no Sam Chauhan … but then again, she’s also no Sam Chauhan. Live Poker Training — Not sure if Shaun Deeb needs a life coach or just a mom. But either way, he’s got a boot camp March 26-27 … for players wanting to learn how to win so much money it doesn’t matter if you never learned to throw away pizza boxes or lift the toilet seat. Zynga PokerCon 2011 — you know they are new to poker when they call their inaugural event Poker CON. But the best we can tell, even though the folks at Zynga supposedly have made millions without paying out any winners, they aren’t the second coming of UB … but they could well be proof that recreational players are more valuable than online pros. And they’ve hired me (along with Michele Lewis and BJ Nemeth) to tell you all about the Zynga version of BARGE — so already we think they’re great, obv! 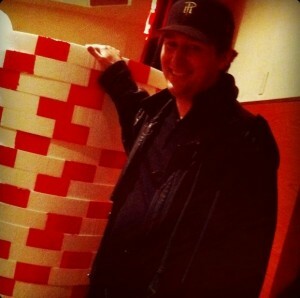 Suited Cribs — The guys to handle your WSOP housing needs, and all variety of poker services, from laundry runs and VIP transportation to nightclub line passes. Say you heard about them from Pokerati for a special surprise AND to have me personally check out your summertime Vegas rental to make sure the internet works and no pillows smell like urine. Zynga Poker fans: It’s a good bet that the majority of commenters and likers here aren’t familiar with the phrase “don’t tap the aquarium”. Yeow. Is this what poker has been missing all along? Power Hours and Free Kitties!?! So simple, so brilliant … how did PokerStars or Full Tilt not think of it? Forget rakeback, black cards, rush poker, final-table patches, re-entry and cashout tournaments … just give away a few cartoon images and let the people play! And that’s when they rebuy? OK, maybe I don’t have the Zynga equation down exactly yet, but that’s some of what I’ll be looking into as Zynga’s inaugural PokerCon comes to Las Vegas, March 18-19, at the Palms. 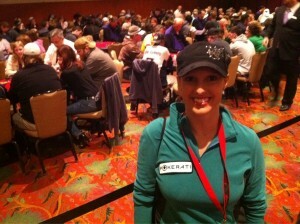 I’ll be part of a team covering Zynga PokerCon with Michele Lewis and BJ Nemeth.